Oh. yes!!! Finally, you have a date! You’ve put it on your calendar and you prepare right away. Perhaps you get a new outfit, update your hairstyle or spend more time than seems logical researching restaurants and events to get ready for the first date. First impressions are critical, and you don’t want to fail this test! It’s important always to be yourself, but you need to balance that honesty with your best manners that will help put your date and ease. All too often just getting the first date with a new person can seem like a feat in and of itself, so don’t wreck it with these classic first date mistakes! Generally speaking, arriving late is considered rude and is disrespectful to the other person. That’s never a great first impression. 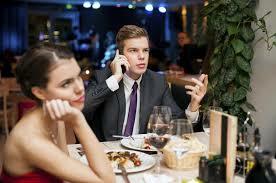 Additionally, showing up late can allow anxiety to mount and doubts to take hold while your date awaits your arrival. You want to meet your date, especially for the first time, when they are happy to see you and excited about the possibilities of the evening. It’s a date, not a race, so plan the outing with thought and consideration. Alleviate some of the pressure and plan a date that has flexibility built into it. You don’t want to enjoy a romantic dinner where the conversation flows only to rush to make the movie because you already bought tickets for the next showing. Believe it or not, how you treat wait staff and the people serving you can make it or break it for many dates. Often it’s the small things that reveal true character and many people, especially ones who have worked as a server, won’t want to waste time on someone who is rude and dismissive to staff. While one or two drinks can help you relax and open up to a new person, overindulging can quickly lead to an embarrassing, or potentially dangerous, situations. Keep yourself safe and free from embarrassment by watching what you drink on a first date. Think of a first date as a job interview—you want to be yourself, but the best version of your authentic self. Like an interview, a first date isn’t the time for going off on political rants, conspiracy theories, or shedding light on the darkest skeletons at the back of your closet–this is especially true for talking about past relationships! While over-sharing creates one set of problems, keeping quiet can create a different set of problems. Do your part to keep the conversation flowing: ask open-ended questions, answer questions with more than a yes or no, and try and keep the conversation balanced so that one person is responsible for the conversation. Good chemistry, natural conversation, and a good time that leaves you wanting to know more are the hallmarks of a memorable first date. Once you understand the simple mistakes that can derail a potential relationship before it beings, you can do your best to avoid these mistakes and put your best self forward. Next Should You Let Go Or Try To Make It Work?